Wisdom is the sum of the reflective and reflexive understandings that settle deep in one’s soul after a long journey — a life adventure peppered with laughter, tears, fear, foolishness, joy, doubt, amazement and wonder. Pay attention to those who have traveled before you. Ask questions and listen with your whole being. Like echoes in a canyon, the lessons will continue whispering their meaning. What follows is Part IV of a five-part essay on health and wellness for seniors. As I begin writing this section, the US population is 312,805,052. Of these residents, 13% are 65 or older. By 2020, that percentage will jump to 16.1%, a gain of 1.2%, while those under 20 will drop by .05% and those in the 20 – 64 cohort will drop by 1.2%. And, according to the US Census Bureau, by the year 2030 (closer than you think), seniors will comprise close to 20% of the total US population. 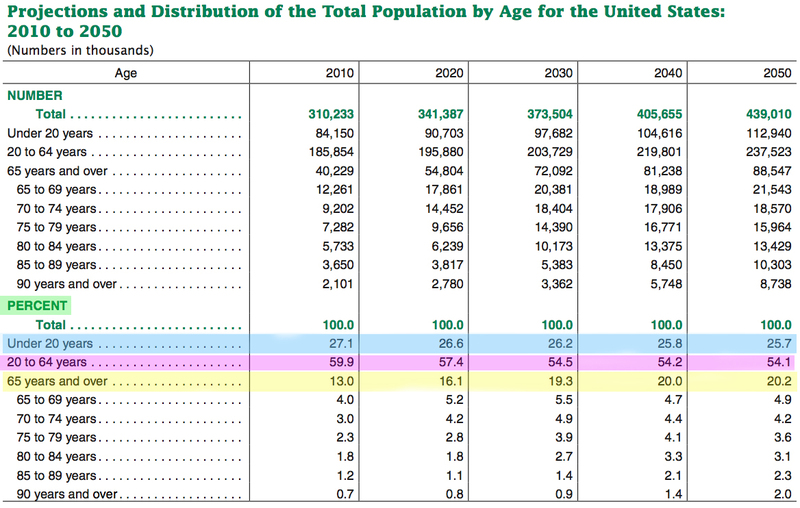 In just 18 years, one in every five US residents will be over the age of 65. Are you ready? Ready as an employer? Ready as vendor? Ready as a taxpayer? Am I ready for an increasing older workforce? Am I ready for an increasing older consumer base? Are we ready … ? Part V: Summary – So What?